“The message is the medium.” With the explosion in use of mobile messaging apps, Marshall McLuhan, were he writing today, might be tempted to reverse the wording of his famous dictum. Total monthly active users of mobile messaging platforms reached approximately 5.7 billion worldwide in January 2018, including more 1.3 billion users on both WhatsApp and Facebook Messenger, according to Statista. If in fact all those users were human, and they didn’t overlap across platforms, that would constitute roughly three-quarters of the world’s population. Irrespective, the point stands: mobile messaging is the new medium. Actually, it’s more of a renewed medium, joining a roster of old standbys. These include SMS, MMS (which enables branded content via smartphones’ native rich media support), push messages and in-app messaging. SMS, the original mobile marketing vehicle, soldiers on as both a promotional and a customer relationship management medium. An example: during a recent service visit to my local car dealer, the technician sent me texts that included short videos to update me on the work being performed on my car. These enabled me to accompany the repairs as they happened. The upshot of greater transparency: more faith in the process (and, by extension, the provider). SMS traffic in the US declined from 2015 to 2016, according to CTIA‘s Annual Wireless Industry Survey, but volume was still a healthy 1.66 trillion messages. MMS traffic, by contrast, rose 27%, to nearly 278 billion messages. Marketers have adapted their approaches based on consumers’ clear preference for messaging experiences — part of the emergence of mobile as a dominant channel for multichannel marketers that I wrote about in a previous post. The share of marketers currently using or pilot push notification and/or in-app messaging surged 37 percentage points from 2016 to 2017. Those using mobile messaging applications reached 68%, not too shabby for a survey debut. 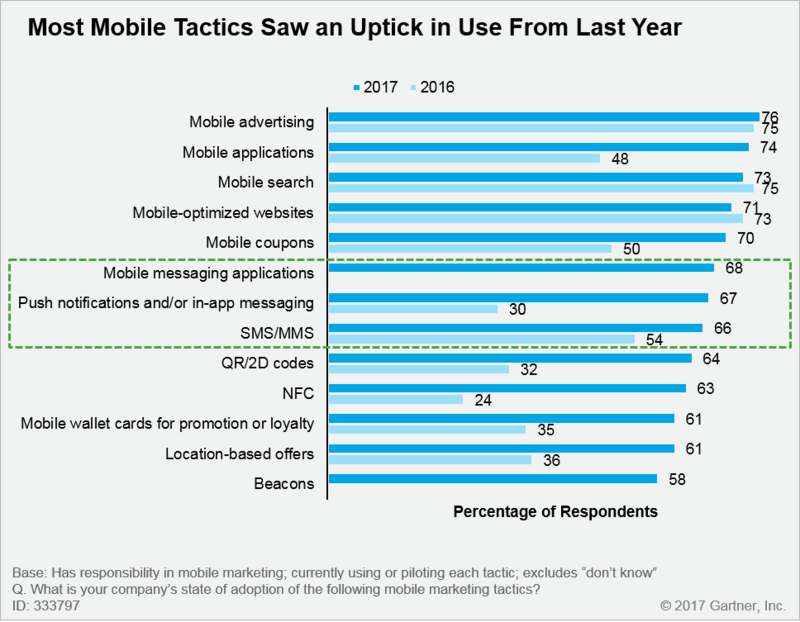 Even the venerable SMS/MMS saw at 12-percentage point increase year-over-year. More importantly, when viewed as a group, the triumvirate of SMS/MMS, mobile messaging applications, and push notifications or in-app messaging has a higher level of adoption than mobile advertising among a base of mobile marketing experts. Not surprising, when you consider that messaging, in all its diverse forms, can come into play across every phase of the customer journey. Marketers need to develop what my colleague Charles Golvin refers to as a “ladder of engagement,” mixing a variety of approaches that leverage what each messaging medium excels at delivering. He notes: “Building a ladder of engagement via multiple messaging approaches enables marketers to strike what they believe is an optimal balance between reaching the most customers as possible and delivering a customer experience superior to that of their competitors.” His report, “Optimize Messaging’s Role in Your Mobile Marketing Strategy” (Gartner subscription required), is a great starting point for Gartner clients. The key is offering sufficiently granular preference setting to consumers that respects how they want to interact with your brand, the desired cadence of those interactions, and the content they wish to receive from you. It’s important to identify where, when and how mobile messaging can support effective campaign activation and execution based on its ability to facilitate data-rich, real-time engagement, but don’t lose sight of the importance of the permission factor. Messaging is, after all, the most personal medium on our most personal of devices. My colleague Charles Golvin will be digging into the mobile tactics that are most effective at driving conversion in his must-attend session at Gartner’s 2018 Digital Marketing Conference: “Mobile: The Best Channel for Conversion,” on Wednesday, May 16.